The R-PLEX Rat A2M Antibody Set includes a matched capture and detection antibody pair and calibrator for the quick and easy measurement of A2M in biological samples. R-PLEX products leverage MSD’s electrochemiluminescence technology for better sensitivity and a larger dynamic range than traditional ELISAs. R-PLEX matched antibody sets enable the development of singleplex and multiplex immunoassays. Individual assays may be developed using MSD avidin- or streptavidin-coated plates. Custom multiplex assays with any combination of R-PLEX analytes, as well as R-PLEX plus U-PLEX analytes can be developed on U-PLEX MULTI-SPOT plates. To learn more about the advantages of R-PLEX products click here. 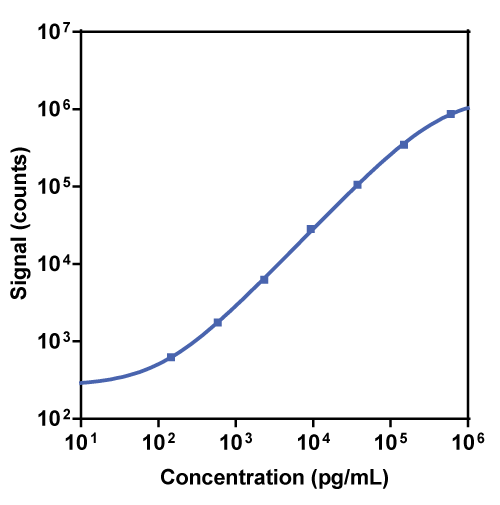 Calibration curve for the R-PLEX Rat A2M Antibody Set was assessed and representative data are presented below. Description - Alpha-2-macroglobulin (A2M, Alpha-2-M, CPAMD5) is the largest non-immunoglobulin protein present in plasma and a major representative of the alpha-macroglobulin family. A2M is a 720 kDa protein composed of four identical subunits, each with five different reactive sites. A2M is synthesized locally but plasma A2M levels are mainly determined by liver synthesis. A2M functions as an inhibitor of fibrinolysis and coagulation. Elevated plasma A2M levels are indicative of kidney failure. A2M also associates with amyloid-beta and so is of interest in research on Alzheimer’s disease. Susceptibility of adult and senescent Brown Norway rats to repeated ozone exposure: an assessment of behavior, serum biochemistry and cardiopulmonary function. Acute phase response, inflammation and metabolic syndrome biomarkers of Libby asbestos exposure.